I have a three-year-old Shih Tzu that started slobbering, can't close his mouth, therefore can't eat. I've had to put his wet Science Diet in the blender with water, so he can "drink" his dinner. The Vet said his fifth nerve in his cranium is infected and said it can come on without any known cause, but for another $250.00, he can put a wire in his jaw that might help him close his mouth. 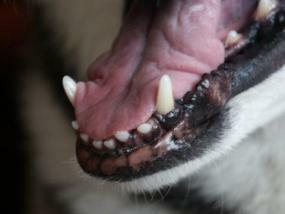 Have you ever heard of Slack Jaw Disease in dogs? What is your opinion on putting a wire in his jaw? He's not slobbering as much as he was the first day or two, but he's sure not well. They have also put him on Antirobe 75 mg and Prednisone 5 mg. I am so sorry to hear of your Shih Tzu's illness. This breed is especially dear to my heart. I am not a vet and have had no personal experience with a fifth nerve infection, but my understanding is that it is a very painful condition, and it is recurring, with brief periods of intermission. I'm thinking that since this condition is fairly rare, your own vet may not have had much opportunity to deal with this condition before. If it were my pet, I'd hold off on having his jaw wired and focus on a solution to the underlying cause of the problem. The Prednisone will help control the drooling at this point. As for the Antirobe, according to Pfizer, the manufacturer of Antirobe, this medication should only be given for twenty-eight days before discontinuing. It could be beneficial for you to contact the Veterinary School at Michigan State University, and relay your dog's case history to them. A lot of my dog show friends have taken dogs there for intensive treatment of other conditions and have a lot of faith in the facility. I am not sure which part of the country you live in, but you could try consulting with them via e-mail or phone to begin, and they may be able to recommend a top notch facility closer to your home. In the meantime, continue feeding your dog as you are, and try to keep him as comfortable as possible. I honestly believe this would be the best course of action at this point. Please keep in contact, and let us all know how things progress.